Just in case you thought that this title is an oxymoron – think again! I just got off a google hangout with the group of nurses and nursing students who identify as such, and are in the last two weeks of launching the first Rebel Nursing conference! You can see more about the conference itself on the web page that outlines the program, but before you have to ask — yes, I will be there! Along with over 250 others who obviously are eager and proud to be a part of this momentous occasion! This conference came about as a vision of Sarah Lipkin, who is a master’s entry nursing student at Yale University. Sarah contacted me almost a couple of years ago because she had read a little ad about Cassandra: Radical Feminist Nurses Network in a 1980’s issue of Sinister Wisdom. Sarah shared her idea about starting a Rebel nurses conference, and wanted to find out more about Cassandra and what we did way back then! So I have been connected with the group putting the conference together, but mostly, I am watching in awe as they have moved along to make this happen! 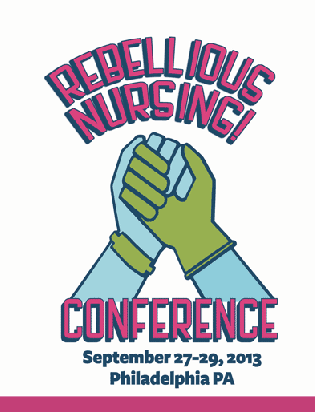 Envisioning justice and liberation for health seekers, health workers, and communities, the Rebellious Nursing! conference is uniting nurses at all levels of practice, other healthcare providers, and our allies to find inspiration, awareness, solidarity, and practical ways to impact health equity and health disparities among all living beings. That statement alone is like no other that most of us have even seen associated with something in or related to nursing! But it also represents an ideal, a yearning, that many nurses have had over several generations. Many of us have taken steps large and small to realize this kind of vision for nursing and health care, but I believe that this conference, and the group organizing the conference, are making an historic step forward in bringing such a vision to reality. Accessibility for all is a huge priority – every discussion, every plan, takes into account every imaginable type of accessibility. Name tags are cut out of cereal boxes, with holes punched so that you can run colorful yarn through them to hang around your neck or pin to your clothing, and you will decorate your name tag, with the name you prefer to be called, when you arrive. On the registration form, the first question is your preferred pronoun. Child care is free, and lunch is provided for child care workers. Rooms are set aside for self-care and meditation, and volunteers will be available to help folks who might be triggered emotionally during any of the sessions. Plenaries are designed more for participation and everyone’s input, rather than lectures or talks. I could go on. Yes, feminist groups and other groups focused on social change have done this kind of work in the past, and the ways that these rebel nurses are going about their work is very much like activist groups everywhere. But this has never happened, to my knowledge, in nursing before. We attempted things along this line when Cassandra was active in the ’80’s, but this group of amazing nurses is so much more “capable” than we were then. And, they have the advantages of technology that we did not even dream of! They have formed a large network of supporters from all over the country, many of whom are not able to be at the conference, because of a now widespread urgency among many nurses to address social justice in health care. This network is also possible because of the ease and accessibility of email, the web, Facebook, Twitter – you name it, they are on top of it! All of the planning, which involves a number of people who have never met in person, has happened using google hangouts and google drive, email, and the web. So stay tuned .. I will “report” on the experience of the conference later this month. But I hope you will find inspiration just by browsing the web site, and imagining what our nursing and health care world could be like with even the tiniest of movement in this direction! This entry was posted in Health Care, Making change, Politics, Social Issues and tagged Rebel Nurses, rebellious nursing, rebelnursing.org. Bookmark the permalink. 9 Responses to Rebel Nurses! This is going to rock so hard. I am so impressed with the work of the conference organizers. So so so impressed. Can’t wait! Excellent! Right on target! Sounds like we now have an Emancipatory Nursing Association to join! Yes! I am so looking forward to this conference! Wish you could be there too! I know – don’t think I can manage it this year – but hopefully next year! great news!! I’m signing up.